I’m pretty sure that 3-year-old Charlotte is officially going on 13. Usually when she earns a time out, I take her to her room and shut the door. But the tables have turned. Now when she acts up, she runs to her room and slams the door in my face. It’s not dramatic at all or anything. And the other day I started making cookies and asked if she wanted to help and SHE SAID NO. To cookies. To mother-daughter bonding time. What is going on?? Send help. Aren’t strawberry and lemon just the best combo? Seems natural to add it to shortcake. Especially since I’ve still got some crazy determined lemons hanging around on my tree outside. Seriously guys, it’s July, I’m picking peaches and plums, and you lemons are still thinking that this citrus party is rockin on. Well I’m all for it actually. Never enough lemons. Especially when it comes to Strawberry Lemon Shortcake. 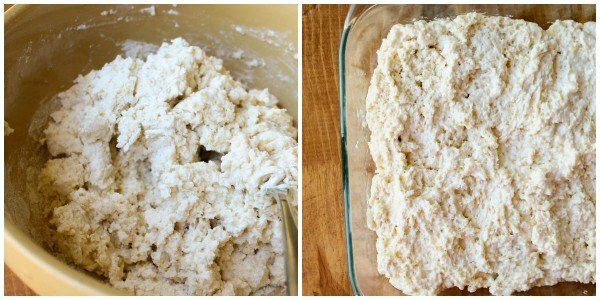 I love this recipe because it’s soooo easy. There is no butter. As much as I love you, dear butter, you are annoying to cut into flour. 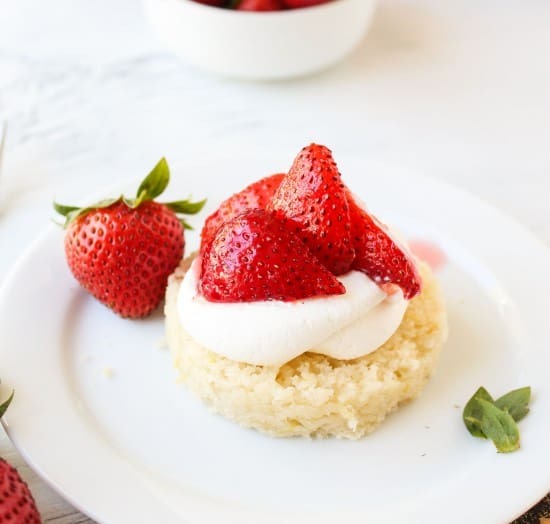 All you have to do for this shortcake is get the dry ingredients together and stir in some cream and lemon juice. Easy peasy. And then you bake it in a pan instead of rolling it out and cutting it, or dropping it onto a pan. You bake it all together and cut it afterward. So much faster. Also, so much softer. If you’re not into a soft shortcake recipe, this isn’t the one for you. And did I mention the lemon whipped cream? Lemon. whipped. cream. Watch out, 4th of July BBQ. I’m ready for you. 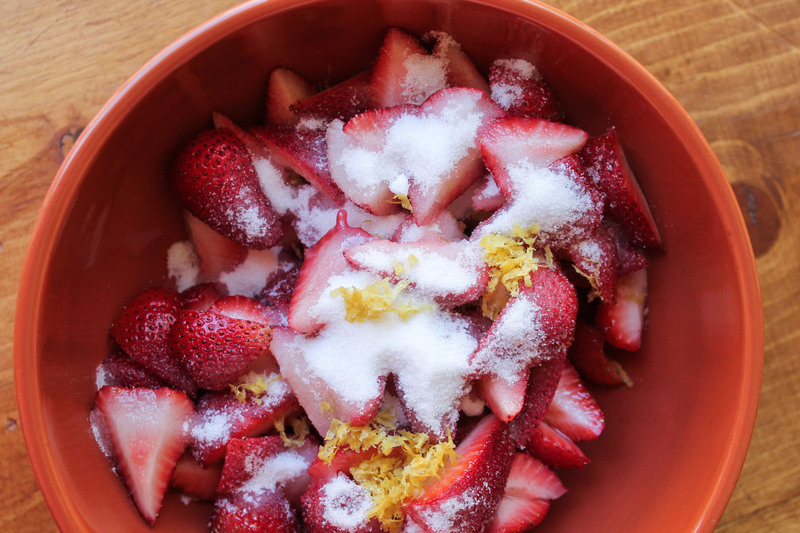 In a medium bowl, sprinkle the sliced strawberries with 1/2 cup sugar and 1 teaspoon (or more) lemon zest. Mix and refrigerate while you prepare the shortcake. 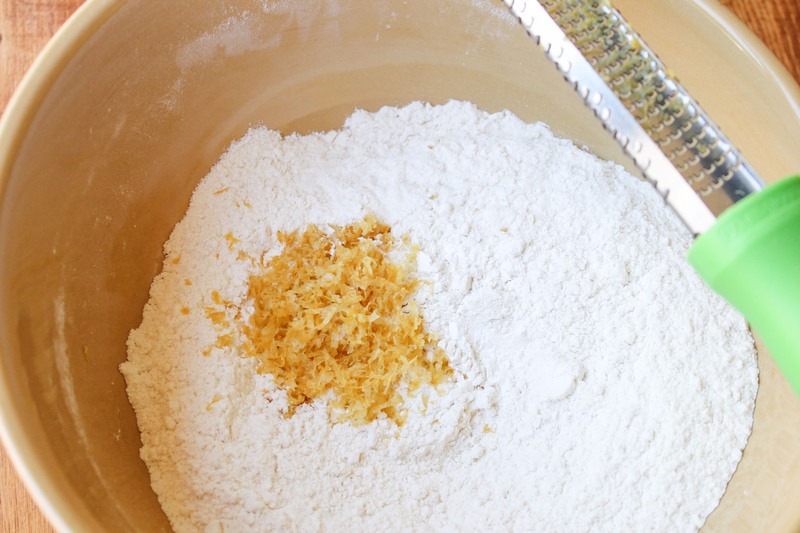 In another medium bowl, whisk together flour, 1/4 cup sugar, baking powder, salt, and lemon zest. Use a fork to stir in the cream--do not over mix. While there are still some flour-y spots, add the 1/4 lemon juice. Continue to combine until it has just come together, just a few turns. Grease an 8x8 inch baking dish with nonstick spray. Spread the batter into the pan. Bake at 400 F for about 18-20 minutes, until golden brown around the edges and a toothpick comes out clean. Let cool for 10 minutes. Carefully lift the shortcake from the pan and let sit on a wire rack to cool some more. Make the lemon whipped cream. Take your empty mixing bowl out of the fridge. Add the heavy cream and beat on high. Gradually add in the sugar, lemon zest, and lemon juice. Continue to beat on high until stiff peaks form. 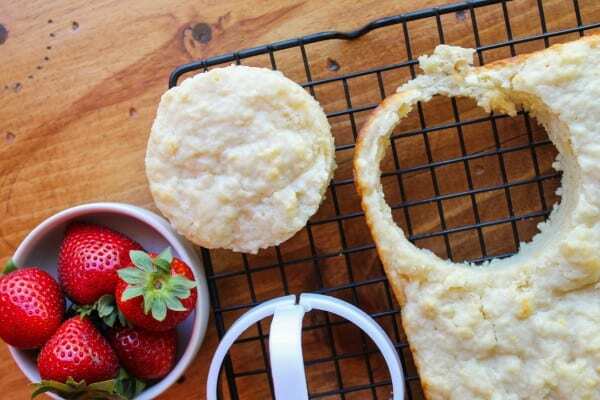 To assemble, place the bottom half of a shortcake on a plate. Top with strawberry topping, lemon whipped cream, and then the other half of the shortcake. Top with more whipped cream. Enjoy! Source: Shortcake inspired by The Kitchen McCabe and the Food Network. Whipped cream recipe from Epicurious. Zestify that lemon. Add more!! Stir in the cream and lemon juice with a fork, then spread it in a pan. 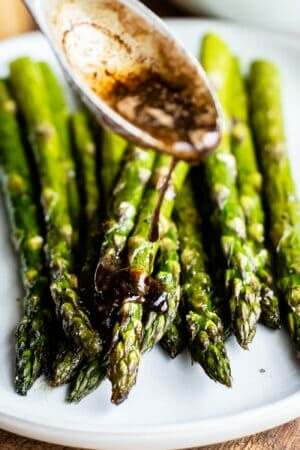 Next Post » Some 4th of July Recipes For You! For the shortcake, is it 1/4 cup of lemon juice, or 1/4 of the juice squeezed from a lemon? And if so, how big of a lemon are you using? Thanks! Hey Mattie! You will need 1/4 cup of lemon juice that has been squeezed from a lemon. If you use a large lemon, it should be about 1/4 cup. That totally reminded me of the movie “13 Going On 30!” Except, well, toddler style. And if she won’t take your mother-daughter bonding time, can I be the substitute? Especially if you’re making shortcakes — these look incredible! 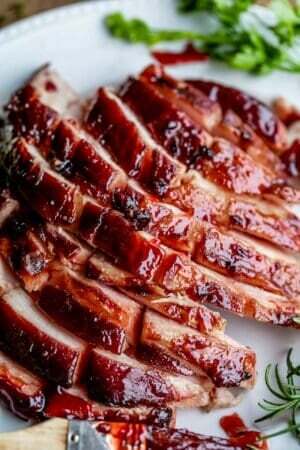 So light & tender & juicy & perfect. Yum! All I have to say is FOUR is a zillion times better than age three. Just have confidence in that…and you’ll be able to sleep at night. She’ll still have the same fiery little personality- just won’t be quite so defiant…and ANNOYING. Something about age four…they just start to able to actually use REASON…they’re smarter, better able to express themselves through words, have a better understanding of how to get their way without throwing a tantrum. I’m not sure exactly what it is. But thank God for FOUR!! 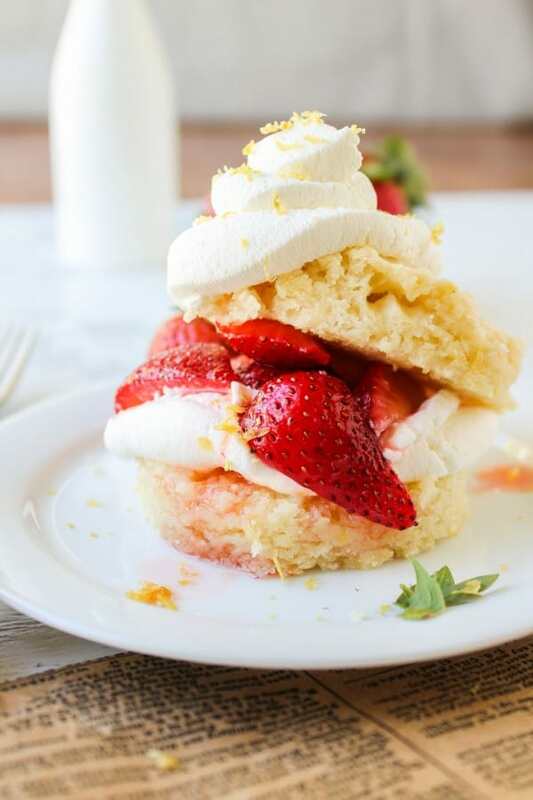 These strawberry lemon shortcakes look delicious! These shortcakes are just the treats to help get us through these times. Yay for not having to cut any butter into the flour. I love the strawberry and fresh lemon combination! Yes! Strawberries and Lemon ARE the best combo! 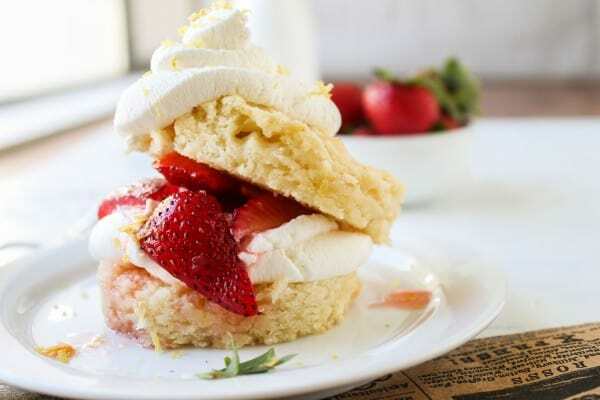 And those shortcakes look so flaky, serious hunger paisn over here…. This looks absolutely amazing, Karen! Looks delicious! I need to add the word ‘zestify’ to my vocabulary immediately! ;) Have a happy 4th!!! Ok, I LOVE that there is no butter in this! I’ve never had a soft shortcake, so I am totally giving this a try. I’m always running out of butter, so this is going to save me on one of those nights where I’m desparate for cake but there’s not a stick of butter in the house. Love this, Karen! I would really like one of these for breakfast please!! 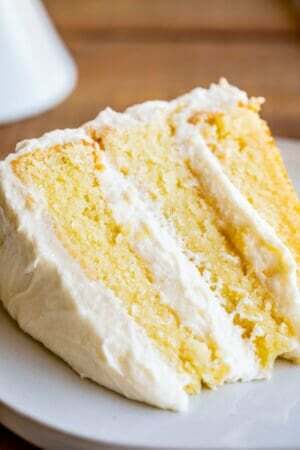 They looks so light and fluffy.. and lemon whipped cream…say no more! 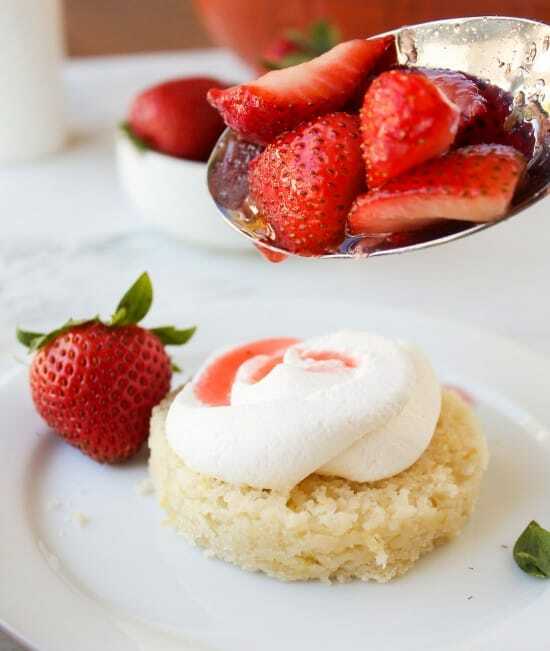 This shortcake looks Fantastic. Love the lemon! I say that about my two year old girl all the time! She hasn’t quite reached the door slamming point yet but the sass in her tone sometimes? I swear I flash forward to her at 13. Anyway — these look incredible, as always! Strawberry and lemon is such a sunny combination. Yikes, you’re in for it, Karen! And I’m speaking from experience as a former hideous, hormonal, horrible teenager. 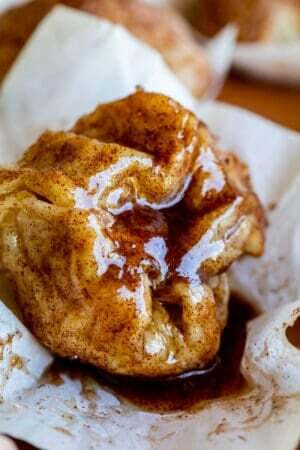 Just keep making delicious desserts like this to comfort yourself. Damn, lady, this looks ridiculously good. And YES to not cutting butter into flour. I totally prefer your “dump liquids into a bowl and stir” method. OMG !! these are just perfect summer treats!! Gorgeous! I know multiple people who would die for this. And the whole method looks just too easy NOT to do. Lucky you with all that picking deliciousness right off the trees! Oh, wow, this looks perfect for a summer barbeque! Fresh, light and citrusy. Thank you for sharing! 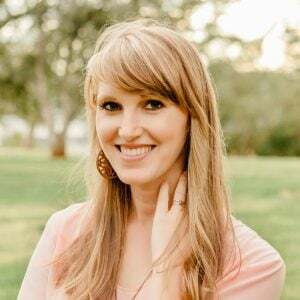 Oh man – I used to do similar things to my mom … I feel so bad when I think back on it all!! And these shortcakes look amazing – I love the strawberry / lemon combo – it’s such a good one! Oh daughters, they are such a hoot. Trinity was FIVE the first time she told me I was “Ruining her life!” Solidarity sister, hang tough. Amen to cutting in butter! Haha. 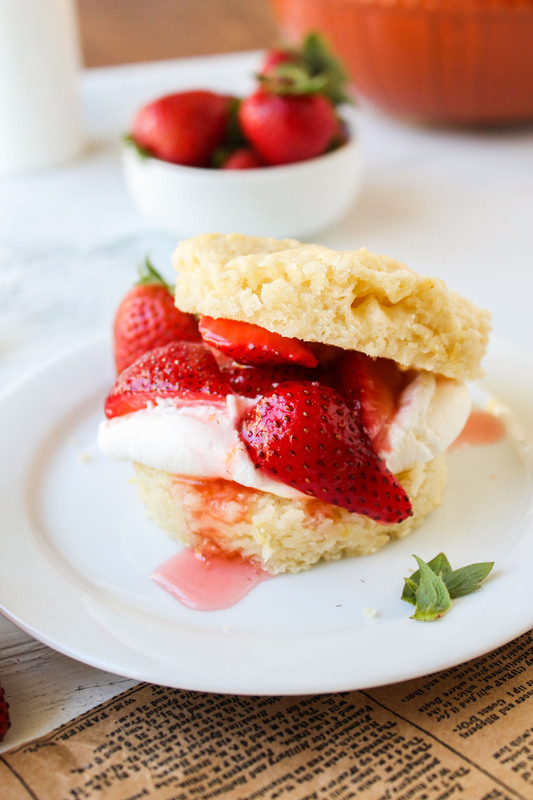 I love homemade strawberry shortcake and this sounds delicious. Also, Wendy occasionally does that same run-to-her-room-and-slam-the-door thing and I don’t even do time-outs with her unless I need a time-out myself. ;) Sometimes she just needs her space I guess and then I open the door to check on her and she’s sitting in her bed with a pile of books, grinning happily at me and whatever she was wailing about has been forgotten. Oh sweet toddler girls! Sounds amazing! I love strawberries and the fresh lemon taste must be awesome in combination. Especially as the days are getting hotter and hotter we need something fresh with it. :) Thanks for sharing this.